Of DC's Golden Age characters, Starman was one of the most beautifully illustrated. Artist Jack Burnley had a dynamic, yet realistic style that reminded me of another early comic master, Alex Raymond. He was also great at covers, I can imagine issues of Adventure Comics with his artwork on the front really stood out in the stands. Great cover, Ross! 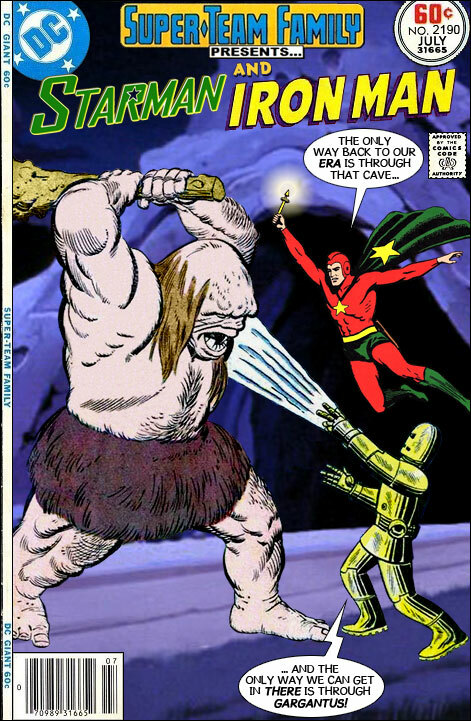 Was this from the Silver Age Marvel issue where the giant caveman turned out to be an alien robot? Yes it is, Tales of Suspense #40! Wow! Not just an alien. Not just a robot. It's an alien robot! @TJW: "Yep! That's why good old American robots is so inferior. We're always out-sourcin' our technology to them dang aliens!" We outsource to people in other countries. Outsourcing doesn't go to people from other planets.